Please refer to the information below for further details. The Leopold B. Felsen Award for Excellence in Electrodynamics (henceforth the Award) was originally established jointly by the University of Siena and the University of Sannio, funded through a donation from Michael and Judy Felsen in fulfilment of the last wishes of their father, Professor Leo Felsen (1924-2005). Since from 2015, the Award is established by the European Association on Antennas and Propagation (EurAAP). The main purpose of the EurAAP Felsen Award is to keep alive Prof. Felsens memory and scientific legacy, as well as to foster academic excellence in the electromagnetics community, by giving recognition to outstanding fundamental contributions from early stage researchers in electrodynamics. The EurAAP Per-Simon Kildal Award for best PhD in Antennas & Propagation (henceforth the Award) has been created through a donation from Cécile Schilliger, Madeleine Schilliger Kildal and Susanne Schilliger Kildal, in memory of their husband and father, Professor Per-Simon Kildal (1951-2016). 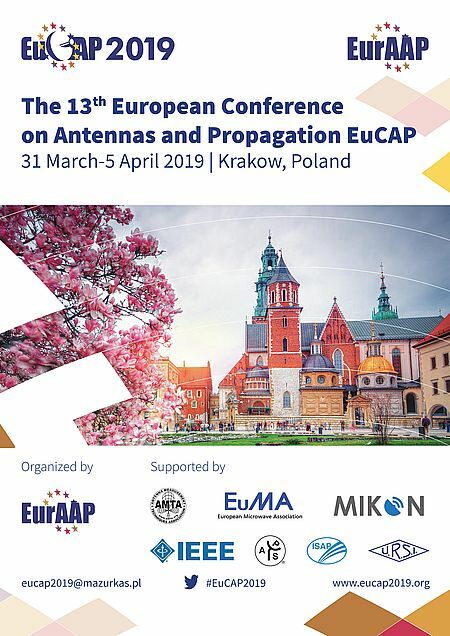 Since 2018, the Award is established by the European Association on Antennas and Propagation (EurAAP). The main purpose of the EurAAP Kildal Award is to keep alive Prof. Kildals legacy, as well as to foster the work of young researchers in the fields of Antennas and Propagation. This award recognizes an outstanding dissertation by an individual who has earned a doctoral degree. The dissertation can be in any discipline in the field of antennas and propagation. The EuCAP 2019 Best Paper Awards have been created to contribute to the recognition of scientific quality of research and engineering in four thematic domains (Measurement/Propagation/Electromagnetism and Antenna Theory/Antenna Design and Applications) whereas Best Student Paper Awards are not related to a specific thematic domain. in Europe or in relation with European actors. The Award, by nomination only, will be presented annually. Members of the EurAAP Board of Directors or any other official position within EurAAP are not eligible during their term or in the 2 years following the end of the same. Nomination/endorsement by members of the Awards Committee is not allowed. If a member of the Committee wishes to nominate/endorse a candidate, he/she will be replaced in the committee for two years. The Awards are granted every year, during the European Conference on Antennas & Propagation event. Starting in 2015, 2 Awards are established: the EurAAP Antenna Award and the EurAAP Propagation Award. All EurAAP members can nominate candidates. They must provide a biography of the nominee, which highlights the reasons why he/she should be considered for the prize. The candidate can also get endorsements from other EurAAP members. The recipients of the Awards will be selected by the EurAAP Award Committee, chaired by the leader of the EurAAP WG Societal Issues. The members of the committee are appointed for a three-year term by the EurAAP BoD on behalf of the EurAAP Delegates Assembly. Their deliberations will be confidential, and their decision final. The awards will be presented during the European Conference on Antennas & Propagation Conference Dinner. Nomination forms must be submitted by 15 February 2019. All documents and endorsements have to be provided with the nomination form available here. The Awards Committee will inform the BoD of the final decision before February 28th, 2019. All the documents should be sent via email to the Chair of the Awards Committee EurAAPawards2019@euraap.org. Candidates from all areas of Electromagnetics are eligible to apply. Selection will be based on quality and significance of candidate's contribution to the field, and on the recommendation of the referees. The Award, by nomination only, will be presented annually, as a career award, to an early stage researcher. Eligible nominees should be under 40 years of age at the submission deadline. Previous awardees (also from the former Sannio and Siena editions) are not eligible. The award consists of a prize of $5,000, which will be funded by the Felsen Family through a donation. The Award will be officially presented every year at the banquet of the European Conference on Antennas and Propagation (EuCAP). Three representative publications related to the topics listed above. Scientific standing of the candidate. Nomination forms must be submitted by 15 February 2019, together with the publications and endorsements requested using the nomination form available here. The Awards Committee will inform the BoD of the final decision before February 28th, 2019. All the documents should be sent via email to FelsenAward2019@euraap.org (Prof. Galdi with copy to the Chair of the EurAAP Awards Committee and to the EurAAP Chair). Selection will be based on the quality and significance of the candidate's contribution to the field, and on the recommendation of the referees. The Award, by nomination only, will be presented annually to an early stage researcher. Candidates for the award must be nominated by their PhD supervisor. A letter of nomination from the dissertation advisor stating the value of the dissertation in terms of its originality, significance, and potential applications in the field of antennas and propagation. An extended abstract of the PhD thesis (maximum six pages) including a list of refereed publications resulting directly from that dissertation. At least two and no more than three supporting letters (not counting the nomination letter from the dissertation advisor), all of which must be from institutions outside the one granting the dissertation. One of the letters must be from industry. Originality, influence, and relevance to the field. The selection will be made based only on the contributions made during the course of the PhD. The Award Committee has the option of not giving an award for any given year if not enough submissions of quality and relevance have been received. Nomination forms must be submitted by 15 February 2019, together with the publications and endorsements requested using the nomination form available here. The Awards Committee will inform the BoD of the final decision before February 28th, 2018. All the documents should be sent via email to KildalAward2019@euraap.org (Prof. Maci with copy to the Chair of the EurAAP Awards Committee and the EurAAP Chair).